Mayfair Gardens strikes the perfect balance thanks to its location situated in a quieter part of Paphos, yet remaining within easy walking distance from all of the delights this resort has to offer. 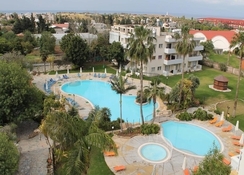 A great place for families to stay, you can discover beautiful sites from the Kato Paphos harbour and the beach that overlooks the Mediterranean - all just a short walk from the hotel. Whether you’re looking to head out into the town or stay in resort, you’ll find plenty of great culinary experiences. The city offers a wonderful array of taverns, restaurants and bars serving authentic local Greek and Cypriot dishes as well as international cuisine. A day discovering all that the Mayfair Gardens Hotel has to offer may see you hit the on-site gym, chill out by the swimming pool or unwind with a relaxing massage, plus there’s a children’s club to keep your little ones entertained, too. For exciting days out, don’t miss the must-see attractions such as the Tombs of the Kings and Medieval Ottoman Baths, offering a slice of the island’s captivating history. 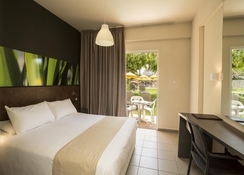 There’s also great fun to be had for all the family at destinations such as Akamas Nature Reserve and Waterparks, before returning to a fully-equipped, spacious room or suite – promising ultimate comfort during your stay. Mayfair Gardens is well situated in a prime location. Paphos International Airport is just 19km, a taxi journey will have you to your hotel in around 20 minutes. The main public beach is 900m away, making it comfortably walkable. The historic site of Tombs of the Kings is just under a mile away. If you’re looking to fit in some shopping, then you may want to head to the Kings Avenue Mall, which can be reached in around 5 minutes. A host of fantastic restaurants area also just a few minutes away, where everything from Indian, Chinese and Mexican as well as the popular local Taverns serving traditional Cypriot and Greek food. Your stay at the Mayfair Gardens offers comfortable rooms and suites each equipped with essential amenities to ensure a pleasant stay is had by all. 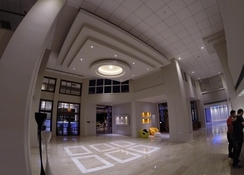 There is a choice of Studio and One and Two-Bedroom Apartments available. All rooms have a chic and tasteful look and feel to them and come furnished with everything you will need for your stay, including air-conditioning and heating, T.V. hairdryer, tea and coffee making facilities and a safe deposit box. Apartments are equipped with a kitchenette, perfect for those longer stays. 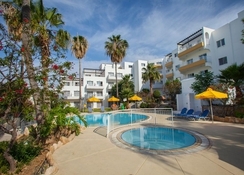 Both studios and apartments come with a private balcony with views or either the hotel gardens or the swimming pool. Wi-Fi is available but is charged for separately. There are a host of fantastic restaurants to be found but a few minutes away from the Mayfair Gardens, where everything from Indian at the Namaste Indian Restaurant to Chinese and the Imperial Chinese Restaurant or for something a little more local try Kyra Frosini Tavern just one of the many serving traditional Cypriot cuisine. Back at the hotel the main restaurant, Alexander, offers guests both local and international dishes, including views over the pool, stop by here for breakfast and dinner, however it is closed for lunch at which point you can check out Taverna Al Fresco offering both a la carte and a lunchtime buffet. There are also two poolside bars for you to relax by with a fine cocktail or beer in the evening. Mayfair Gardens is a delight to rest and relax at. 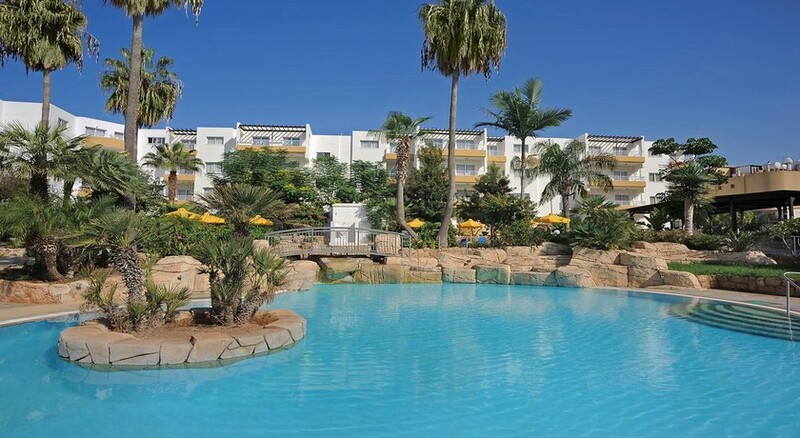 As its name implies, its set within lush landscaped gardens where you’ll also find two outdoor swimming pools plus two further pools just for children. If you want to stay more active you can visit the on-site fitness centre complete with a gym and fitness centre, meanwhile, at the spa, you can detox in the sauna, relax with a deep tissue massage or treat yourself to a luxurious facial. Out in the main downtown area of Paphos itself, there’s plenty to keep all the family entertained. Historic sites such as the Tombs of the Kings and the Agia Solomon Catacomb and Paphos Mosaics will all take you back in time. If you want to cool off and have fun at the same time, then try Paphos Waterpark, in which kids both big and small can enjoy the lazy river, wave pool, slides and much more! Had a great holiday, staff were friendly, food was very good, Hotel is in a residential area, but only a 10/15 min walk to harbour & 10 min to beach. Only disappointment was that the Hotel was having a refurb & half of the Hotel was closed & also the nicest of the 2 pools which we were not advised about by teletext Holidays. Otherwise we had a great Easter Break in the sunshine & would return to this Hotel. Glenn & Sharon from Guildford Surrey.